Attain tactical superiority with the Smith & Wesson SWHRT9B Black HRT boot knife. As a distributor of military accessories and tactical gear, Smith & Wesson is a reliable source for self-defense needs. Law enforcement and military personnel rely on the high-quality products S&W offers to get the job done in intense situations. This blade represents some of the finest cutlery that the company has to offer in their long line of products. Sporting a sleek black frame, this durable Smith & Wesson product is an optimal choice for knife enthusiasts. The fixed blade is comprised of hardened 440C stainless steel that can stand strong with daily use. The knife is coated with a black powder finish that gives it a militaristic aesthetic. The blade length measures 4.75 inches, and the handle measures 4.25 inches. This makes for an overall length of 9 inches. The weapon has a weight of only 7.2 ounces, which makes it easy to rapidly draw and wield. This dual-edge tool is extremely sharp and conducive to sharpening for maintenance. The spear point frame also features a blood groove that reduces the overall weight of the weapon. Tough materials can be sliced by this blade with ease. In addition, the rubber handle features an ergonomic design with grooves and a lanyard hole to run cord through. Users can maintain a solid grip for fine-tuned control of the product while protecting their hands with the over-sized guard. The lanyard hole at the end also provides the ability to tether the product to the wrist, helping prevent disarmament attempts. The knife is themed after the elite Special Operations and SWAT teams fielded by the FBI and law enforcement. It sports the designation of the Hostage Rescue Team, whose mission is to defuse dangerous hostage situations. The tool comes with a high-quality black leather boot sheath that fits comfortably against clothing. The weapon and sheath are designed to be concealed within a boot, hence the name. However, the weapon can also be clipped to the side of a belt if desired. A steel pocket clip is conveniently included with the sheath for this purpose. It also features a button for secure closure of the weapon, ensuring that it doesn’t get loose during operations. Designed specifically for self-defense applications, the S&W knife can be a critical accessory for law enforcement. It can serve as a backup weapon, easily concealed inside a boot, which can neutralize an advancing opponent in close-quartered combat. 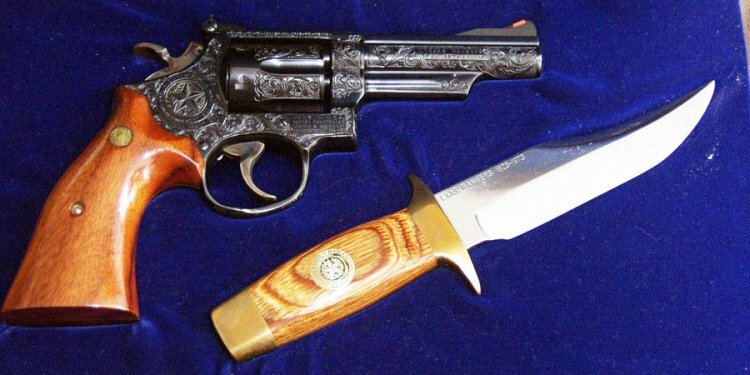 The knife represents essential additions to hunting and law enforcement gear. Its steel is specifically designed for durability in intense situations. Its ability to be easily concealed also makes it a valuable weapon to carry in tandem with a gun. Capable of fulfilling lawful offensive and defensive purposes, it’s an excellent choice. Optimal for law enforcement and knife enthusiasts, the blade is a resilient weapon that can make shoes lethal repositories. The Smith & Wesson HRT Boot Knife is a tactical weapon that gives its wielders another line of defense.